What is ion milling ? 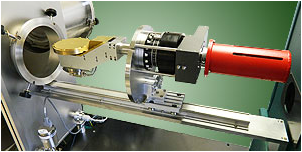 Ion Milling is a physical etching technique whereby the ions of an inert gas (typically Ar) are accelerated from a wide beam ion source into the surface of a substrate (or coated substrate) in vacuum in order to remove material to some desired depth or underlayer. It is easily visualized as "atomic sandblasting", or more accurately "ionic sandblasting". Vacuum levels are typically in the lower end of the 10-4 Torr range where the mean free path (MFP) is longer than the distance between ion source and the substrate. The MFP is the average distance an atom, ion or molecule can travel in a vacuum chamber before it collides with another particle thereby disturbing its direction to some degree. This pressure range also equates with the narrow operating pressure range for typical wide beam ion sources (1x10-4 Torr to 5 x 10-4 Torr). Below this range the ion beam source cannot sustain a plasma (the source of the ions). The continuous bombardment of the substrate by ions results in conversion of kinetic to heat energy and subsequent heating of the substrate. Substrate cooling is often required to prevent damage. Some of the kinetic energy from the incident ions results in substrate top layer atoms/atom clusters/molecules/secondary ions being driven away from the surface. Heating the substrate, or letting it heat up in vacuum due to the process itself, can in fact accelerate the etch rate as substrate heating adds energy to the surface particles allowing them to be ejected with less incident kinetic energy. This may also be undesirable since it is a runaway condition. A 30o to 60o incident beam angle significantly increases etch rate versus normal incidence. Depending on the material the rate enhancement can be up to 50%. The secondary ions coming from the material layers on the substrate surface can be analyzed in-situ to determine arrival at a specific underlayer. 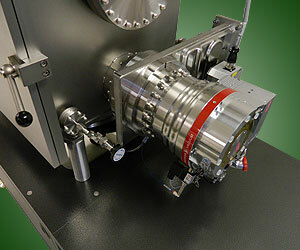 This "end point" detection technique is called SIMS (secondary ion mass spectroscopy). A detector is fitted near the substrate surface to accept these charged particles as they are etched from the surface and determine their relative intensity. For example: A Si wafer is coated with 100 nm of SiO2 and then 100 nm of Cu. The top of the Cu is patterned with a photo-resist mask designed to leave behind an array of Cu dots. When the ion milling begins, secondary Cu ions are detected by the SIMS detector as having a significant intensity. As the milling process starts to punch through the Cu top layer and into the SiO2, the intensity of Cu starts to diminish and the presence of SiO2 is first detected and then starts to increase substantially. Eventually the Cu intensity is minimal and the SiO2 intensity is significant. Where the "end point" should be depends on the desired structure. In the case of the Cu dot array it would typically be when the Cu has reached a minimum and is no longer diminishing indicating only the sides of the Cu dots are contributing to the Cu intensity count. These sources are basically two nested cylinders with a common open end. At the closed end process gas (Ar) is admitted in the proximity of a filament which produces electrons by thermionic emission. These electrons in turn ionize some of the Ar gas atoms. The open end of the cylinder is fitted with carefully aligned, complementary, electrically isolated grids (typically Mo, W or graphite). Ions are attracted to and will pass through the floating, inner "screen grid" which will develop a small negative potential, the same a sthe plasma potential. As they arrive at the screen grid some ions will pass through/are pushed through the holes of the screen grid. Once these ions pass through the screen grid they immediately pass through an aligned hole in the outer, "accelerator" grid which is at a high positive potential thereby accelerating them away from the source at high energy (e.g. 600 eV). Typically the inner cylinder (anode) is also at some lower positive potential to prevent sputtering while a multicusp magnet array is used to enhance the ionization efficiency. As the ions are accelerated in the direction of the substrate they are repelling each other since they are primarily positive ions. As a result the beam diverges as it gets further away from the source. The lower the beam energy, the higher the divergence angle and vice versa. A neutralizing filament is used to add an equal number of electrons to the beam to minimize the divergence and prevent substrate charging. A typical neutralized beam from a source with flat grids has a divergence angle of about 6 o -7o. Concave grids can be used to compensate for this divergence or to focus the beam. Alternatively, convex grids can be employed to create a beam with a wider divergence angle to improve uniformity over a larger area at the expense of current per cm2. RF Gridded source are used for reactive gases (e.g. O2) and are similar to DC sources with a few notable exceptions. They use no filament inside the source and the neutralizer filament is protected within a small can with a hole on one side that is flushed with inert gas to prevent filament burnout from reactive gas use. Finally they utilize inductively coupled RF power to ionize the gas. The use of reactive gas allows for not only physical etching but also chemical etching via the reactive gas itself. This reactive ion beam etching (RIBE) is particularly useful as anisoptropic structures (having straight sidewalls) can be fabricated and etched material can be volatilized and pumped away vs. simply scattering it in the chamber as with simple, physical ion milling. These sources are both capacitively and inductively coupled and deliver moderate currents at comparatively low energy (50-200 eV). They are also referred to as "quasi-neutral" as they emit equal amounts of ions and electrons and thus require no neutralization. They are useful for mild, low energy milling of delicate substrates and can be used at higher pressures as efficient gas cracking devices. * These two types of sources are also referred to as "Kaufman sources" after their inventor/developer Dr. Harold Kaufman. The goal of the initial development was for efficient ion thrusters on space vehicles. 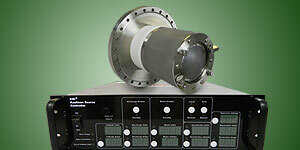 **A typical example of such a source is the patented COPRA source developed by CCR Technology. In most cases it is desirable to have a water-cooled substrate holder with tilting (incident angle adjustment for rate maximization) and ideally azimuthal substrate rotation for optimizing uniformity. Other specialty holder have also been developed which introduce reactive gases for RIBE and heated holders which increase rate. It is important to realize that flowing the maximum recommended amount of gas into an ion source will give the highest current output as long as the the vacuum pump is large enough to keep the chamber pressure in the low 10-4 Torr range. 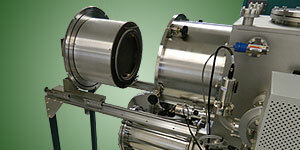 The more gas one flows and the larger the ion source is, the larger the vacuum pump needs to be. 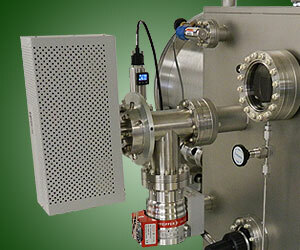 It is possible to operate a given ion source with an undersized pump but the source's ion current will be compromised.